Simon & Schuster, 9781451695755, 320pp. From the critically acclaimed and “bitingly intelligent” (The New York Times Book Review) author of December comes a buoyant and beautiful new novel about a family struggling in the aftermath of a suicide. Since the tragic loss of her seventeen-year-old daughter less than a year ago, Joan Jacobs has been working hard to keep her tight-knit family from coming apart. But it seems as if she and Anders, her husband, have lost their easy comfort with each other and are unable to snap back from their isolation into the familiarity and warmth they so desperately need, both for themselves and for their surviving daughters, Eve and Eloise. The Jacobses flee to their summer home in search of peace and renewal, but moments after they arrive the family is confronted with an eerily similar tragedy: that same evening a pickup truck had driven into the quarry in their backyard. Within hours, the local police drag up the body of a young man, James Favazza. Winthrop delivers a powerful, buoyant, and riveting new novel that explores the complexities of family relationships and the small triumphs that can bring unexpected healing. The Why of Things is a wise, empathetic, and exquisitely heartfelt story about the strength of family bonds. It is an unforgettable and searing tour de force. Elizabeth Hartley Winthrop was born and raised in New York City. She earned her BA from Harvard University and her MFA in fiction from the UC Irvine, where she was the recipient of the Schaeffer Writing Fellowship. She is the author of the novels The Why of Things, Fireworks, and December. She lives in Massachusetts with her husband, daughter, and St. Bernard. "An outstanding, uplifting novel about how one family keeps on living after tragedy strikes... and strikes again." "Winthrop writes beautifully about family bonds made solid by respect, kindness, integrity, and commitment." 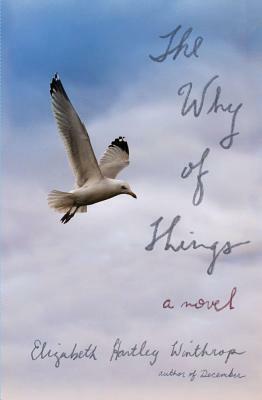 "Once again, Elizabeth Winthrop conjures light from a dark place in her beautifully constructed, touching novel The Why of Things. Why do some so loved willfully leave us is the question Winthrop sets out to answer--and what meaning she renders from this mystery! The book starts and ends at the same quarry's edge, but a quarry changed. Winthrop's quiet magic makes the water's mutable darkness bearable and better--nothing to be afraid of, a substance of possibilities." "Elizabeth Hartley Winthrop is one of the finest writers of her generation. With deeply moving intelligence and a clean, spare style, she gets right to the heart of loss and survival."